Today’s guest post comes from a precious friend of many years with whom I have spent far too little time face-to-face. In fact, had I not opened an email from a stranger, we might not be friends at all. Some years after Guy and I graduated from Fuller Theological Seminary, Danielle and Matt followed in our footsteps. As married seminary-educated ministry teams are all too rare, friends and mentors told them we needed to meet and passed on our contact info. We exchanged emails until we all moved from SoCal to NorCal and finally met in person. We are so grateful others thought to introduce us! Three Humphreys babies and a couple of churches later, they are in Oregon while we remain in NorCal and we remain grateful for social media that keeps us connected and praying for this sweet family. When I was a kid, I loved to doodle, cut-and-paste paper creations, and would go to school sick so I wouldn’t miss that week’s art project. In third or fourth grade, my teacher looked at a paper mask I made and told me I outdid myself. I glowed in the affirmation of what I loved doing. From FIMO creations to beaded necklaces to decorating homecoming floats in tissue paper, being creative just seems to be in my DNA. In college and beyond, I grew as a visual artist, squeezing in a few art studio classes with whatever free electives I had as a science major. Sculpture and interactive art that invited engagement, like the swings I hung in the university plaza and the “GO” signs I made and installed along bike paths, or even the paintings dealing with my own biracial identity played on themes of whimsy and the potential for deep commentary and conversation. I would have switched my major to art studio, but let’s just say my parents were already disappointed that I got off the pre-med track. In college and beyond, I grew in my relationship with Jesus and found that the intersection of faith and art just made sense to me. I was invited to use creativity in worship services and retreats through response stations and by designing the environment. My own participation in creative response stations and taking in the visual environment are ways that help me have a heart connection with God while reflecting on how to live out my faith in everyday life. In an increasingly visual world where so much is communicated and felt through design, image and color, I am almost equally if not more impacted by the visual “message” of a worship service (yes, even the fonts matter!) as I am by the sermon itself. I imagine I am not alone in this reality. Sometimes, my creativity feels like it has shifted to satisfy more utilitarian needs like cooking, making Halloween costumes for my kids, throwing themed birthday parties, and designing print communications for our church. And while I can lose track of time pouring myself into these things (I once spent an hour carving a watermelon to look like the Death Star), it doesn’t satisfy the desire to go deep; to unite creativity to communion with God, truth, wonder, and wrestling. Where the process itself is like entering another dimension where time slows down, I can hear the whisper of God and sometimes see life more clearly. 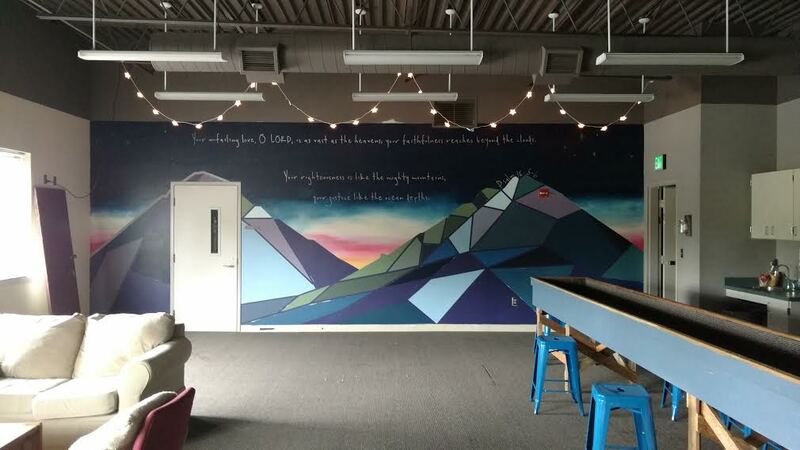 The most recent experience I had where the process of creating art drew me closer to God was a couple of weeks ago when I helped paint and redesign the high school room at church. As a long-time youth pastor/leader, I strongly value involving students in the creative process and invite their ideas and input. Would it be easier to just design and execute the ideas I have in my head by myself? Absolutely. But I have found that the benefit of working on a collaborative art piece far outweighs the messiness of involving others and the balance and simmering down of many ideas. Students especially need the affirmation that their creativity and faith are valuable and beautiful. And so I may gently guide and nudge ideas I’ve been collecting for months on my Pinterest board, but I try to be an adult that says, “YES! That’s a great idea, let’s do it!” because I want to help students not only have a hospitable place that inspires their faith, but I want their creativity to feel at home in the church and see how this might be a way God wired them to connect with their Creator. 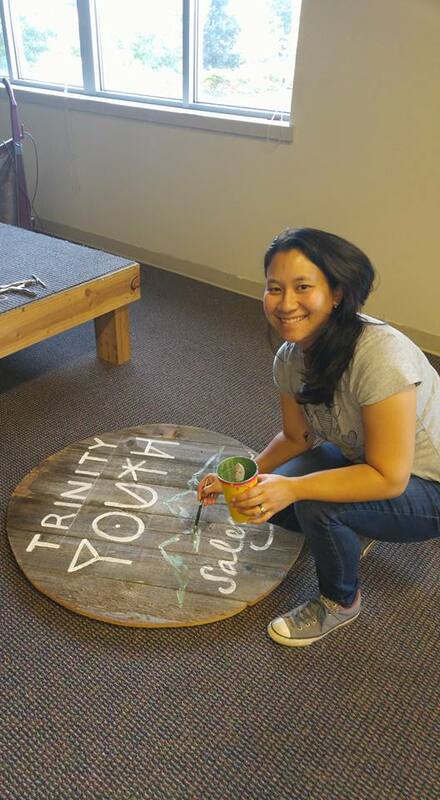 Working with students on art projects is not only a way to create a mosaic or stage design or mural, but an opportunity for discipleship, encouraging reflection on one’s spiritual journey. 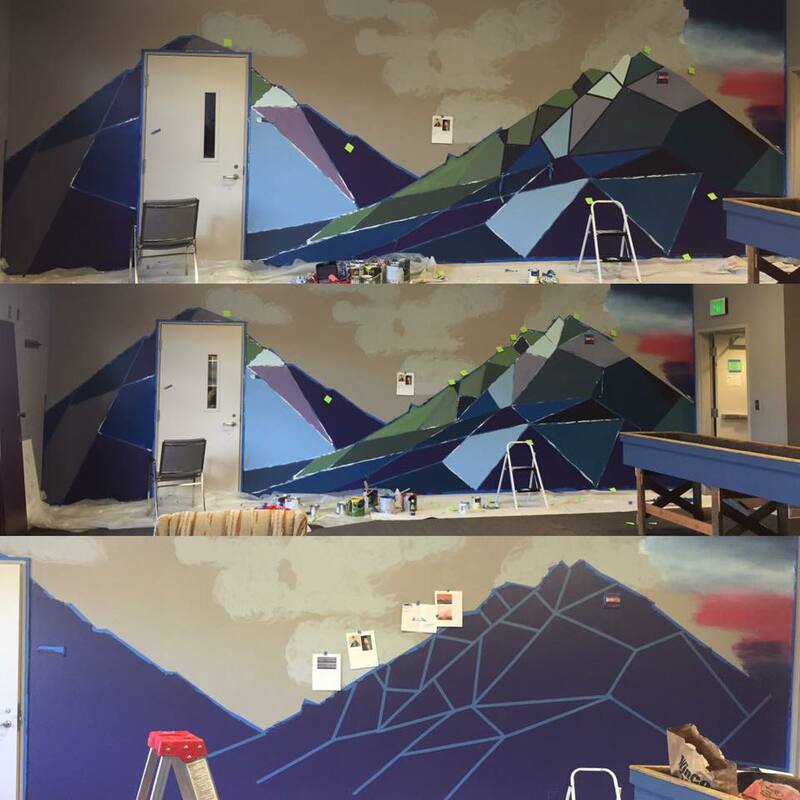 I love our mural of the Sisters Mountains with its taped off edges and facets, the night sky and sunset. The concept for this wall went through much evolution from my initial offering of building trees out of reclaimed fence boards or using something more temporary like canvas banners. But it’s awesome. And it’s not perfect. Parts could be touched up, and the door still needs to be painted, but many hands and minds came together to create this majestic offering. 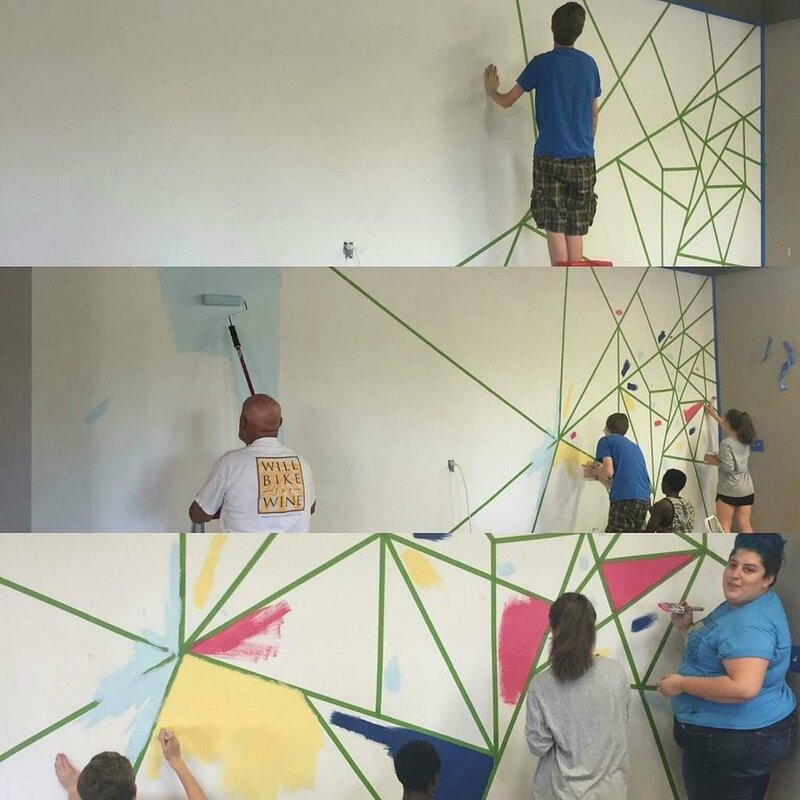 And while I thoroughly enjoyed working on this mural with others, I didn’t mind when the school year started and our students weren’t able to help as much. I happily added the finishing touches from writing the verse to individually gluing tiny Swarovski crystals into constellations on the night sky, smiling at the idea of someone with eyes to see noticing the unexpected twinkling reflection of light. In my alone times, I cranked up my favorite worship songs and blended colors into a sunset while God blended love through music and paint into me. I thought about the real Sisters Mountains I’d seen earlier this summer; the expanse of the night sky with its starry host declaring the grandeur of God, the same God who created all of it, and who created me, too. I hope that those who use this space, created with a heart of worship, will encounter God’s loving Spirit and hospitality. Danielle is a native Bay Area gal, adjusting to life in Oregon, married to Matt and mom to 3 pint-sized humans. She has a B.A. in Aquatic Biology, an M.A. in Theology (Fuller), and enjoys conversations about church, community, Jesus, and gardening. She is also a lover of good food, music, creativity, and outer space. Her neglected blog is daniellehumphreys.wordpress.com. This entry was posted in create, Uncategorized and tagged art, church, communion with God, create, creativity, Creator, Danielle Humphreys, faith and art, Fuller Theological Seminary, Jesus, ministry, painting, Pinterest, youth ministry by Milagro Mama. Bookmark the permalink. Thanks for sharing this. I am glad you took pictures of the process. The wall looks awesome! I have ALWAYS enjoyed your take on things, and I too find great sense in the intersection of art and faith. I’m encouraged by your post and miss you a lot Humphrezio!